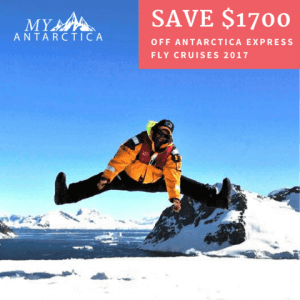 Get in early for some great Antarctica Deals on our shorter Fly Cruise Programs, Antarctica Express. Save US$1700 off Antarctica Express Fly Cruises on board the Ocean Nova and Hebridean Sky for season 2018/2019 with our Air Credit Promotion. Book your cabin by the 15 December 2017, and get US$1700 per person off the regular rate to spend on your airfares to reach South America instead. So you can make it to Antarctica in less time and for less cost than you imagined with this limited time Antarctica Deal. With cabins starting at US$2,995, there’s never been a better time to book yourself to reach the white continent. But at this rate, space for this Antarctica deal will go quickly. Secure your spot today! Ever wanted to discover Antarctica but not sure if you have the time? The Antarctica Express program is a 6 or 7 day fly cruise style tour of the South Shetland Islands and Antarctica. You will cruise one way, and fly back on your return* and feel the experience of journeying to and arriving in the white continent in less time than it would normally take. By flying across the Drake Passage, you save yourself 1 full days travel time and shorter program is perfect for travellers who want the thrill of reaching Antarctica but who don’t have leave to spare or who wish to combine this with other destinations in South America. Depending on the voyage, the Antarctica Express program starts or finishes in Ushuaia, Argentina or Punta Arenas, Chile. The Antarctica Express Tour operates on the Ocean Nova Expedition Cruise or the Premium Hebridean Sky Vessel. Single Supplements apply and you can choose different cabin categories.